Every year it’s the same question… “What are you going to be?” Do you have your answer yet? If not, no problem. We’ve done a little internet research for you to find some fun, easy and cheap costume solutions. Snooki: Got a dress that’s too tight, a spray tan, and a couple of cantelopes? 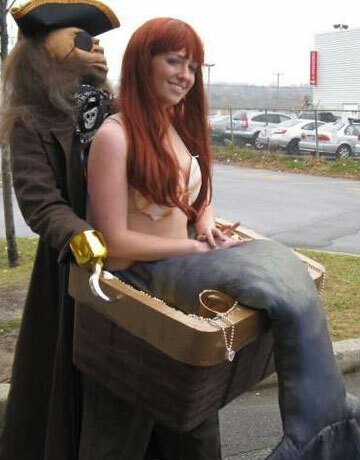 Congratulations, you’ve got a Snooki costume. Just go easy on the Malibu. Linsday Lohan: Want to dress up as Hollywood’s infamously-sloshed starlet, Linsday Lohan? Easy, just wear any old cocktail dress and pop one of those black digital watches around your ankle. Add a little powdered sugar to your upper lip for effect. Disgruntled Flight Attendant Steven Slater: Add a forehead gash and plastic wings to any old shirt and tie or work uniform and you’ve got one angry male stewardess. Don Draper: Although Mad Men isn’t new, the 60’s men’s style is hardly passe. And dressing as Mad Men’s leading man couldn’t be easier if you can get your hands on a vintage suit. A cigarette and tumbler brimming with whiskey complete the costume. We also turned to ehow.com and were not disappointed with their long list of classic DIY options including Elvira, Wonder Woman, and an array of Pokemon characters. 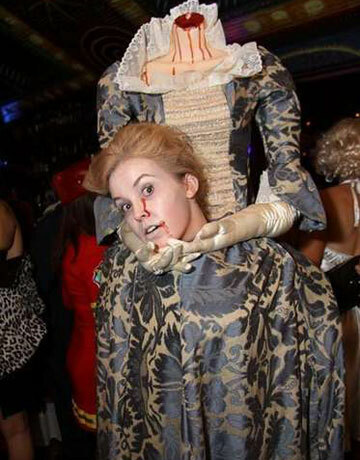 And then for some very creative homemade costumes, The Daily Green has a slide show of 25 goulish ideas including the headless Marie Antoinette (above) and kidnapped mermaid (below). For many carb-fearing gals -the scariest image just might be a human plate of pasta, Lyn Vaccaro makes this look easy in her blog post on Lifestyle. Did we miss any of your favorite DIY costume sites or ideas? Let us know! « Flu Shots Lower the Risk of Heart Attack!